The Fifteenth Judicial District Commission on Judicial Performance unanimously recommends that Judge Gerald Keefe BE RETAINED. 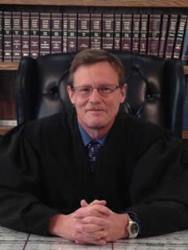 Judge Keefe was appointed to the Cheyenne County Court in November 2011. This is his first retention cycle. Prior to his appointment, Judge Keefe was the Superintendent of the Kit Carson R-1 School District. He received his undergraduate degree and a Masters in Educational Administration from the University of Northern Colorado. Judge Keefe has always been active in his community and his church. During his time as Superintendent, Judge Keefe supported rural music programs by organizing benefit concerts throughout the state. Currently, he serves on both the Keefe Memorial Hospital Board of Directors and the County 911 Emergency Services Board. The Commission conducted a personal interview with Judge Keefe, reviewed opinions he authored, observed his courtroom, and reviewed surveys completed by attorneys and non-attorneys who had interacted with him. Among the survey questions was “how strongly do you recommend that Judge Keefe be retained in office, or not be retained in office?” One hundred percent of attorneys recommended retention. Among non-attorneys, 90% of respondents recommended retention and 10% made no recommendation. Judge Keefe presides mainly over civil actions, misdemeanors, traffic violations and infractions, and small claims matters. Based on the survey results, Judge Keefe received an overall combined average rating that exceeded the average combined rating of all county court judges standing for retention. Both attorney and non-attorney survey participants gave Judge Keefe above average marks in almost every area surveyed compared to other county judges. Specifically, from attorneys and non-attorneys alike, Judge Keefe received high marks in case management, application and knowledge of law, communications, and diligence. He received especially high marks in demeanor from all respondents. Complementing those marks, Judge Keefe is described as courteous, efficient, and fair.